Mathieu Blue and Call Me Adam at Mathieu's show "Falling Into Blue" at The Metropolitan RoomLike the picture to the right, I give Mathieu 2 thumbs up! I was completely blown away by Mathieu Blue tonight at his Metropolitan Room show Falling Into Blue. Let me just say, I fell, deep and hard for Mathieu's talent and vocals! This guy is the real deal! 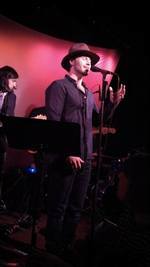 A great mixture of original songs and covers, Mathieu had the Metropolitan Room in the palm of his hands. The crowd was eager and excited for him and I can easily see why! Mathieu's vocals are rich, strong, and soulful! He captivates a room, not only with his good looks and stories, but his gift of music! He had the room singing along to such covers as "Iris" (Goo Goo Dolls), "Halo" (Beyoncè), "You're Still The One" (Shania Twain), and "Rolling In The Deep" (Adele). I feel, if you can cover Adele well, you got what it takes! Mathieu, did Adele well, in fact he did it better than well. The audience went wild for him after this song! Another favorite song of mine Mathieu covered was "I Am Ready For Love," as sung by India.Arie (though I know of it because the great Ellen Greene did a cover of it on her album "In His Eyes"). Mathieu hit all the right notes on this song! Mathieu Blue and Call Me Adam at Mathieu's show "Falling Into Blue" at The Metropolitan Room Mathieu Blue outside The Metropolitan RoomWhat also makes Mathieu a great entertainer are the stories he tells in between songs. He is a big believer in love and the road to love, but also he's had his fair share of heartbreak. Two of his original songs deal with these ideas. First, he sang "Here," the title song to his debut EP. "Here" was inspired by an elderly couple he saw on the news after their house was devoured by a hurricane. They were more happy to have each other than the fact that they just lost their home and belongings. Like Mathieu says, "When you find true love, that is all that matters." The next original song he performed was "Everytime," a terrific song about being on the path to love when dating someone and then all of a sudden, boom, the relationship ends and you are left figure out the why. I think we've all had scenarios like this and Mathieu conveys those feelings of loss perfectly. Mathieu Blue performing at The Metropolitan Room, Photo Credit: Lou RefanoThe hour plus show went by in the blink of an eye, which I know means I had an amazing time! I could have listened to Mathieu for hours more. And that is the sign of a great performer...they leave you wanting more. Mathieu sure left me wanting more! Luckily, he is scheduled to be back at The Metropolitan Room on Monday, December 21 at 9:30pm for his first ever holiday show, with an original holiday song just for us! Be sure to get your tickets today! What else can I say about Mathieu Blue, except, buy his EP Here, watch his video for "Everytime" below, and come see him live! He's one performer you don't want to miss! If you missed my interview with Mathieu about his EP and concert, click here to read it! 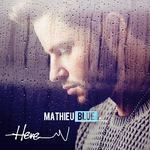 For more on Mathieu be sure to visit http://www.mathieublue.com and follow him on Facebook, Twitter, YouTube, Instagram, and SoundCloud!